Is it worth the money? I know its a L6/Bainite steel and I heard wonderful stories about the steel. But I want to know if it's better then the bugei line of katanas (samurai, crane, bamboo, etc..)? Since the bugei line also range in the thousand dollar range. I have also heard of Howard Clark and he makes the best L6 steel blades and they cost around $7000 and more. I just want to know if this $1669 oni katana L6/Bainite is also good enough to own and practice with and that is comparable to howard clarks blades. 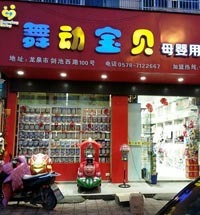 hope you answer soon, thanks for everything and keep up the great business. Howard Clarks L6 blades are tried and tested, and have been around for years. But the thing with L6 is it isn't just the steel, it is the heat treatment that is critical - and no-one that I know seems to have taken the plunge and bought one to put it through its paces. Yea idd oni and praying mantis are a bit temting swords more becouse of the l6 steel..But like paul said we still dont know about there performance becouse who will put a 1400$ dollar sword in a destro cutting test..I must say i dont think they would be like Howard Clark swords but if they are like 70% there performance it will sure do for me.. But who knows untill someone who have perform with the talk about there performance we will live in the darkness:S.. 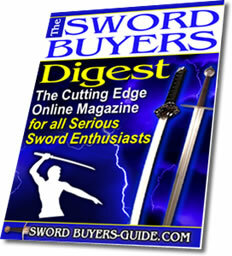 I hope we find out more about those swords in the future so we know how paul chen is doing it with l6 steel who is hard to deal with..
either way ive heard a great few other things about Ron from respectable folk... and if it IS him that deals primarily with the Bainite at Hanwei then im sure that the quality (even if not Howard Clark standard)of the L6 swords they make must deserve some good level of credit. Hey folks, I've been looking to buy the Paul Chen Oni Katana for a long time now. I'm in Toronto, Canada, and can't seem to be able to find one. According to a merchant that I shop from, there are none in stock right now, and they're on popular demand. Apparently, CAS Hanwei has delayed the release of new Oni Katanas for more than a year. Does anyone have any recommendations about where to find the sword or when the sword is coming? I'd be very grateful if someone replied. Hello there. I was waiting for 6 months but now the oni katana is on the way to me. Until tomorrow or the day after I'm gonna hold it in my hands and I'll start some tests. As I see many people wait for long time to receive this katana, and this means that the procedure of making it, is not as the other hanwei products and I guess it is one of the best in the world. 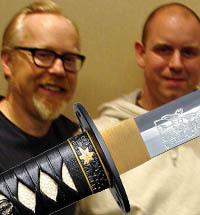 Also son of Paul Chen is making them witch have studied the katana making next to known swordsmen in Japan. I'll get back for more details and test results for the oni katana, but don't expect from me destracting tests, I can't afford them. If you are looking for an awesome katana, the Oni from Team Hanwei, regret buying you will not. good blade, all i can say. neither can i do a destructive test. but i did tri to bend it about 70~80 degrees, and it flexed back without any plastic deformations. but it seems doesn't hold a sharp edge as well as katana made of tool steel such as t-10. I TOOK MY L 6 ONI TO KENDO TODAY TO THE BAMBOO FOREST AT FORT JACKSON SC. THERE ARE SOME REALLY LARGE BAMBOO TREES. I HELD MY BREATH AS MY KENDO A 5TH DAN FROM JAPAN PICKED ON OF THE FATEST TRUNKS OF REALLY HEALTHY BAMBOO. HE SLICED IT WITH EASE. THE CUT WAS EXTREMELY CLEAN. THIS SWORD IS NOT PRETTY HOWEVER IF PERFORMS VERY GOOD FOR THE PRICE. EACH STUDENT GOT TO CUT TODAY WITH MY SWORD. NO DAMAGE WAS DONE TO THE BLADE. FOR THE MONEY IT IS ONE OF THE BEST. for the love of god put a YouTube of u cutting goza show us how u cuz with it! Don't destroy the thing just use it for normal cutting! Too shy for YouTube fine then pleaseeee just do a full review of it! Put some picture of what u cut and of the blade up close. Tell us more please, also I heard it rusts alot faster than other steels and that it loses it's edge faster too, is that true? If yes then what's the point? I too have been waiting a long time to get a high quality katana. Before, I didn't have the money. Now that I do, I'm not sure which way to go. I already have Bugei's Dragonfly but I think a L6 would be great to own. Paul Chen's Praying Mantis looks awfully nice but I'm not sure if it might be too heavy for me. I train with Paul Chen's Tsuru Iaito which is a light weapon and would hate to spend this kind of money and discover it's not the right fit for my needs. Don't you wish you could try them all before you buy? 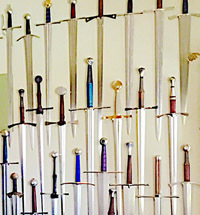 Still, can never own too many swords, right? I will say again and i can not speak for everyone. I practice Kendo and many other arts based on the sword. My Sensei a Godan from Japan was able to cut through 5 inch bamboo green in the spring. oVer and over and over. After cutting 4 he stacked them and then cut them again at the same time. His first comment on the blade was Hamanon Ugly.After testing his only comment was blade looks more pretty. The Oni is a true beast. It has not been sharpened and we all use it to do demos on Bamboo. I have never cut a mat and i have never had it re sharpened. If you are looking for performance and not purely aesthetic then this is a great choice.It will cut a car in 2. Hey, I don't own the blade, but I contemplated buying it a while ago, but settled with the Kami katana. 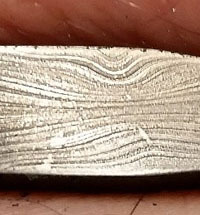 To answer the last comment, this bainite blade is NOT folded, and that's one of the reasons I went with the Kami instead: that, and the fact that it's not a very attractive, and rather bland looking blade. If it were at least a bit more polished I would have gone with the Oni (because I really love the fittings and black ray skin too). About the folded blades: folding the metal was a process that used to strengthen the blade because of the inconsistencies in the metal back then - folding would destroy and equally distribute any unwanted and weak material in the metal, so by folding the metal and spreading the material equally throughout the blade you wouldn't have a blade that was very strong in one area and very weak in another. 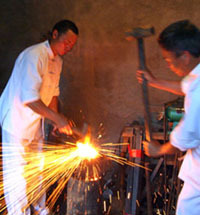 But in modern times we have metals that are far more 'pure' than the ones in feudal times, so folding is more an aesthetic and more historically accurate way of making the blade - you can say, "wow, I have a folded blade, the way they used to make them back in the day", but given the purity of today's steel, again, it hardly strengthens the blade, if at all. 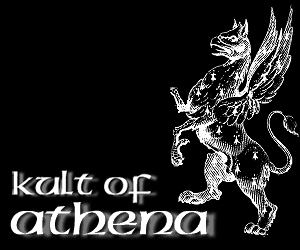 Kult of Athena is selling the oni for under 1100 dollars, and although that is substantially cheaper than the retail price, and cheaper compared to most sword vendors, I don't know if kultofathena.com is a reliable and trustworthy site. 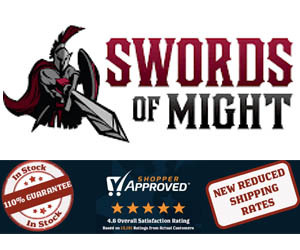 Also, I prefer to see a product like a sword up front before I buy it. I remember I ordered a cold steel katana a while ago (when I hardly new anything about the sword market and sword specifications) and the damn blade was crooked. But I digress: if anyone has actually bought from kultofathena.com and says they're reliable, then the bland and unfolded oni blade may be worth the money. Perhaps even the Paper Crane (which is made from tamahagane) would be worth the money too, because it sells only for $1660 on their site. I hope this helps, and I wonder what people have to say about kultofathena. well guess ill have to drive the 2 hours to london to go see reliks.com 's store and look at one first hand. i should also see if martailartswords.com has more than just a sales office in toronto thats less than an hour drive for me. I'm kinda leaning towards a custom order from mas but at $2k a $1200 oni doesnt sound that bad... assuming i can cut a deal on it reliks has it listed for $1600, and at that price ill spend a little more and buy a custom order mas. Neither Hanwei site, nor the bugei site say that the bainite blade of the oni katana or praying mantis are folded. They are both unfolded blades - also, sword vendors who I have spoken to, and people that have reviewed the sword all say that it is unfolded. There are a few site vendors where I have seen "folded" under their own site description, but this is untrue. If the blade were folded, the sword would definitely sell for retail over 2000 dollars. Howard Clark bainite blades (the smith who has made the toughest bainite blades) which are folded and not even polished sell for about 5000 dollars, and that's just the unmounted and unpolished blades. Unmounted means they don't have fittings, handle, sheath, etc. - just the blade and the tang. Yea, that was exactly my point, that some sites will give inaccurate info. You'll notice the link isn't the Hanwei official site - below the sword list it says "Paul Chen Swords is sponsored by BearArm Ltd", rather than Hanwei. Also, when you click the link for the Oni you'll notice there's no mention of a folded blade in the description, as there is for the Kami katana. Just wanted to state that ive previously owned a onikatana. Aside from the fact that it cleanly cut a flying bumblebee in half, harder targets take a toll on the edge. In my conclusion, its a fleshcutter, not an armor cutter. On another note, ive cut CLEANLY through copper and metal with his tiger katana, ORIGINAL musashi katana(with out the bo-HI)A beast might i add,the L6 ONI..... AND.... a beater made of 440 ss, yess a 50 dollar stainlesssteel blade! Its the wielder, not the sword. Altho i also have to say, the L6 is meant for beginners, ALOT of room for errors. Personaly i would rather break a 1000 dollar L6 than a 10,000 tamahagane blade ANYDAY. Congratulations on the site as well, I've followed it since 2007 and it sure has grown. Keep up the good work! 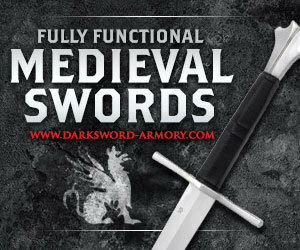 For great prices on knives and swords visit JBC Knives and Swords. I am very pleased with there products and service. Obviously I'd never risk damaging the sword, but could the oni katana hold its own going sword against sword. Like if you were to travel back in time and give it to a samurai, would it break if someone struck his sword? Theoretically speaking, the bainite sword has a tougher structure than tamahagane which the samurai swords were made of. Now the Oni Katana in particular is not made with the same skill, time, and effort that's put into making a Howard Clark bainite sword: Paul Chen's swords are mass produced, which is not to say that they're bad, but they're obviously not on the level of top smiths' works. All of our katana will be sharp as all are made & are very capable for use in the martial art sense. As far as resilience this would depend on the application however I have below some information on our L-6 banite & HWS-1 blades as we have had great customer feed back on these blades. L6/Bainite is a fairly modern creation (Bainite is a phase of L6, made by very careful control of the heat treating process). It is very tough and resilient - it has a high yield point, so that it can be flexed strongly without taking a set, and it holds an edge very well. Until recently was probably the best steel in use for Japanese swords (although the Tamahagane traditionalists would argue). HWS-1 (actually now HWS-1S) is a creation of Hanwei's retired-military metallurgist. The steel is made, and the blades are processed, in Hanwei's new factory in Fuxin. We don't know the full details of either the chemical composition or the processing, though we understand that the carbide content between the blade edge and the spine is manipulated to maximize edge hardness, wear resistance (edge-holding) and resilience. In cutting tests it has proved superior to Bainite and has cut some very hard materials without significant damage. So HWS-1S is our top-performing katana steel to date. To "A response from Hanwei"
I am the person who wrote the comment on August 27 titled "Bainite vs Tamahagane." Firstly, I wanted to thank you for taking the time to post your comment. Secondly, I wanted to inquire about this new steel you wrote about - the HWS-1S. I believe that James Williams' sword for Bugei Trading Company titled "The Old Pine Katana" is made from this steel. I've been thinking about purchasing it for a while. Now I know that HWS-1S is very tough: more resilient than tamahagane. However, can you back up your claims that it is stronger than bainite? 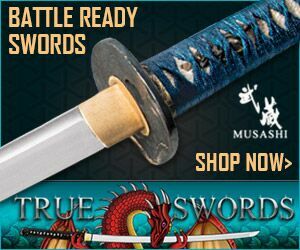 As an interested customer, who has purchased numerous Hanwei products including the Kami and Musashi Katana, I would be interested in viewing a video demonstration where the swords are put under various stressing tasks and resiliance tests. I believe that this is a very smart marketing strategy that the company Cold Steel uses - a strategy that Hanwei could also use. Cold Steel puts their swords under great stress tests that are captured and shown on video: tests such as cutting very large and tough targets, including thick cow ribs, cow skulls, and whole pigs, to name some of the softer, meat and bone targets. Additionally, their swords are shown cutting extremely resilient ship ropes; their swords also pierce car hoods and chain-mail armor. As a satisfied and enthusiastic customer of Hanwei, I'm sure that I speak for many fans of your company in saying that showing similar demo videos by Hanwei would be great. What better way to show off your new HWS-1S steel? 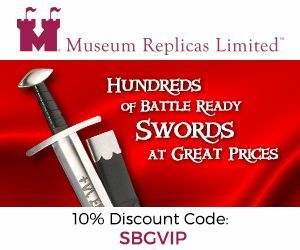 If an HWS-1S sword can do what Cold Steel swords do - like cut through thick ribs and pierce Chain-Mail armor without chipping, then I will think of getting not only one, but numerous swords of the HWS-1S steel. And I'm sure I won't be the only customer. But you have to prove it - show us what these swords can do! Hey i live in europe. Is there ANY way i can get the sword delivered over the atlantic? Hi, i brought one of these for over 1000$ and i cant even get it sharp the steel is so soft it just rolls the edges over, i have tried contacting the buyer i got it from and they refused to do anything about it since i tried to sharpen it. a sword that is described as "extremly sharp" on the box and hanwei have refused any help at all, i even offered to ship it to them so they could inspect it themselves but they werent interested. so for the price your paying id strongly advise not to buy one, go for a cheaper spring steel sword instead, best damn sword steel ive ever used. I'm sorry to hear about your sword issues. I have a feeling, with the closing of one of Hanwei's factories (I think the one in China), it's safe to say that the company is going downhill because it lost a lot of money. Hanwei had reasonably priced swords, but now they're charging far too much money for their products. Come on Hanwei - charging over $1000 for the Musashi katana, which used to be 900 bucks? My recommendation to everyone is to stay away from Hanwei products unless they lower their prices and bring back the quality of their products. Bainite is supposed to be super tough steel - even stronger than 1075 carbon steel, roughly the strength of 1086 carbon steel, and this unsatisfied customer has a supposed bainite sword of which the edge rolls. Intolerable. Regarding the ONI it takes a while to edge properly , I purchased one that had been abused and required file work at the kissaki, and a full polish it is however a substantial blade and an excellent cutter , I tested my tori xl on a 2x2 spruce post and it failed miserably bending at 30 degrees about 12 inches from the kissaki and chipping in 2 consecutive cuts against a softwood! Bs I paid 650 for this sword and will probably never buy another folded Swedish steel blade from hanwei I own a peach monkey Katana that I've only ever used for aido I'm Leary to cut anything with it after the tori fiasco as the blade steel is the same the ONI destroyed the 2x2'with ease no sign of dulling after multiple cuts .nearly performing as well ( nearly) the water quenched mono tempered blade of 1060 steel it did dull substantially however it didn't bend or present monster chipping or chipping at all . I have owned several practical plus and classics from hanwei and they all got the 2x2 test and passed even one practical wakizashi i used to split rounds of dried spruce firewood with . Good ONI bad tori bad bad bad . Oni katana by hanwei,good for the price. Vs tori xl vs 1060 folded mono tempered blade. After testing the oni on firewood stainless light gauge steel garden post and 2x4 it's a great katana . No Knicks bends or major dulling. It is after rigorous cutting hard as hell to edge back to shaving sharp takes a few good hours on stones. I. Hear. The edge rolls. On those oni blades. How is that? After seeing this, Now Im not sure if i want to spend much money for something will looks like other cheaper blades. Atleast if this happens its not so painful and just sharpen it. If I am not incorrect, modern steel usually does not require it to be folded since modern steel is much pure than the steel used in old times. Mkters said folded, I assume just a marketing purpose. I saw on the youtube, that an American tested on Hanwei Oni and the blade chipped. Hmmm.